It would be right to say that electric kettles to heat water have become a way of life in today’s era. Although, the concept of electric kettles is not new, and the concept of heating water is older still, people of all ages have finally woken up to the ease of using electric water heating kettles. Not only at offices or on – the – go, but also at homes, electric kettles are slowly replacing the age old method of heating water on the stove, thus saving precious time and fuel costs. And why shouldn’t that be? After all, ease and simplicity of usage are the prime factors which most people consider these days. 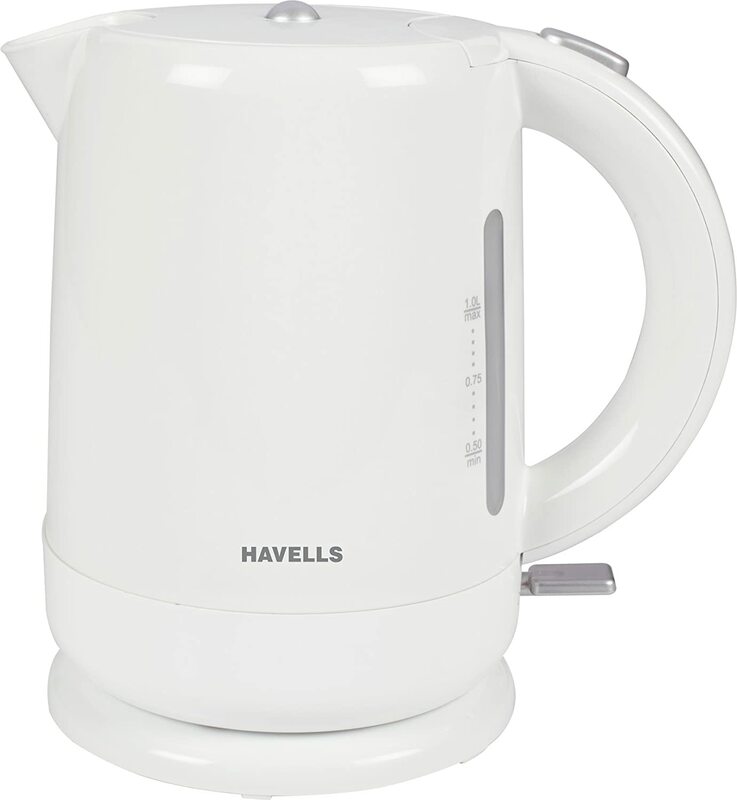 In this review, we have focused on the Havells Aqua 1.0 L electric kettle. This kettle is a very simple and easy to use one, which could be simply put, the kettle’s USP. Just push one button down and you can heat up to 1 litre water without any difficulty and within roughly 2 min., (time estimate depends on the temperature of the water; chilled water may take slightly longer). After putting the kettle in water heating mode, a red illuminating light glows all the time while the water is being heated. It is also easy to open the top lid of the kettle, which just requires a button to be pressed. Water can be heated in the kettle for a myriad range of purposes, for e.g., to make tea/coffee, for medical purposes, for instant cooking purposes, for the purpose of steam intake, and so on. The kettle comes with Auto off facility, so one can put the water to heat and go about other tasks. The dry boil protection feature ensures that the kettle is turned off automatically when there is not enough water. The kettle comes with a transparent water level indicator, and thus ensuring that the water level reflected in the indicator is completely appropriate. The water level indicator also indicates the minimum amount of water needed which is .5 L for this kettle. The Havells Aqua 1.0 L requires 1500 watts of power. It comes with a concealed heating element, therefore, not exposing water directly to the heating element and thus, enhancing the safety features and further making the kettle safe for even small children to use. It also makes the kettle easier to clean. The filter provided in the kettle is removable and washable. To avoid the messiness that comes with all wired products, the kettle comes with inbuilt cord storage in its stand. Once the water is heated you can easily take the kettle off the stand, thereby, making it cordless and further facilitating the ease of usage. However, a major limitation of this product is that water gets heated to the maximum possible, such that it becomes difficult to drink the water immediately after heating up. One has to wait for a few minutes to let the water cool. An added feature giving the user control over the extent to which the water should be heated could be added to the kettle. 2. A prolonged 2 yr. warranty. 3. Curvy design with smooth surface, much different than the run of the mill kettle designs. A rating of 9/10 is warranted given the features of the kettle. To Recieve updates and possible rewards for Havells Aqua 1.0 L please sign in. To Recieve updates and possible rewards for Electric Kettle please sign in.